Of the many stamps that are set apart, for one cause or another, from the ordinary run, as having a history of their own, those that by the common consent of collector and dealer are ranked as great rarities are the most fruitful source of astonishment to the non-collector. They are the gems of the most costly collections, the possession of the few, and the envy of the multitude. In a round dozen that will fetch over £100 apiece there are not more than one or two that can lay any claim to be considered works of art; indeed, they are mostly distinguished by their surpassing ugliness. Nevertheless, they are the gems that give tone and rank to the finest collections. Some of them are even priceless. To the average man it is astonishing that anyone in his senses can be so foolish as to give £1,000 for an ugly little picture that has merely done duty as a postage stamp. He contends there can be no intrinsic value in such scraps of paper, and that settles the matter, in his opinion. But is it not so with precious stones and pearls? They are of value merely because they are the fashion. There is no intrinsic value in them. If they were not fashionable they would be of little or no value. Long-standing fashion, and fashion alone, has given them their value. So it is with stamps; fashion has given them their value, and every decade of continued popularity adds to that value as it has added to the value of precious stones and pearls. There is no sign that precious stones are likely to become worthless by the withdrawal of popular favour. Fashion changes from one stone to another without affecting the popularity of precious stones in general. So it is with stamps. Fashions change from one line of collecting to another without in the slightest degree affecting the stability or popularity of collecting as a whole. Precious stones and pearls minister to the pride of the individual, and stamps to his pleasure; and each has its own strong and unshakable hold upon the devotees of fashion and pleasure. There is a fluctuating market in the case of each of these favourites, but I venture to think that there is, and has been for the past forty years, a steadier rise in the value of stamps than in the value of precious stones. British Guiana, 1856, 1 c.—In 1856 this colony was awaiting a supply of stamps from England, and pending its arrival two provisional stamps were issued, a 1 c. and a 4 c. These were set up from type in the office of the Official Gazette. A small illustration of a ship, used for heading the shipping advertisements in the daily papers, was utilised for the central portion of the design. Of the 1 c. value only one specimen is known to-day, and that is in the collection of M. Philipp la Renotiérè (Herr von Ferrary). Doubts have been expressed as to the genuineness of the copy, but Mr. Bacon, who has had an opportunity of inspecting it, says: "After a most careful inspection I have no hesitation whatever in pronouncing it a thoroughly genuine one cent specimen. The copy is a poor one, dark magenta in colour, and somewhat rubbed. It is initialled 'E. D. W.', and dated April 1st, the year not being distinct enough to be read." This stamp may safely be placed at the head of great rarities. Of its value it is impossible to form any opinion. If a dealer had the disposal of the copy in question, he would probably want between £1,000 and £2,000 for it, with a decided preference for the larger sum. Mauritius, "Post Office," 1d. and 2d.—The best known, the most quoted, and probably the most popular of all the great rarities is the "Post Office" Mauritius, so called because the words "Post Office" were inscribed on one side of the stamp instead of the words "Post Paid." There were two values, 1d. and 2d. They were designed and engraved by a local watchmaker, and were printed from single dies, and issued in 1847. The tedious process of printing numbers of stamps from single dies was soon abandoned, and only 500 copies of each value were struck. Of those 1,000 stamps only twenty-two copies are known to exist to-day. There are in the hands of leading collectors two copies of the 1d. unused, and three copies of the 2d. unused, twelve copies of the 1d. used, and five copies of the 2d. used. These rarities were only in use for a few days, and were mostly used in sending out invitations to a ball at Government House. The value, according to condition, is from £800 upwards for each value, but unused they are of course worth a great deal more. Hawaii, 1851, 2 cents, blue.—Like so many rare stamps, this first issue of Hawaii was designed and set up from type in a printer's office. About twelve copies are known to exist. The stamp was in use but a very short time, as the Post Office of Honolulu was burnt down, and the stock of stamps of this first issue was completely destroyed. This 2 cents stamp is worth about £750. British Guiana, 1850, 2 cents.—This is popularly known as the 2 cents circular Guiana, because of its shape. A notice in the local Official Gazette, dated February, 1851, announced that "by order of His Excellency the Governor, and upon the request of several of the merchants of Georgetown, it is proposed to establish a delivery of letters twice each day through the principal streets of this city." Certain gentlemen were named as having consented to receive letters for delivery at their respective stores, and it was further announced that "each letter must bear a stamp, for which 2 c. will be charged, or it will not be delivered, and when called for will be subject to the usual postage of 8 c." A supply of the required 2 c. stamps was provided by a locally type-set design enclosed in a ring. It is said that this delivery of letters was discontinued soon after it was started, hence rarity of the stamp. Only eleven copies of this quaint postage stamp are known, and its market value is probably somewhere about £600. 27 paras, printed 6,000, sold 3,675. 54 " " 10,000 " 4,756. 81 " " 2,000 " 693. 108 " " 6,000 " 2,568. All these stamps were printed by hand on coloured paper in sheets of thirty-two impressions in four rows of eight stamps. An unused copy of the 81 paras has fetched as much as £350. 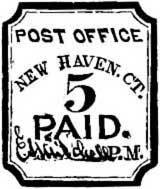 United States, Millbury, 1847, 5 c.—In the United States the general adoption of postage stamps was preceded by what may be termed preliminary issues, of a more or less local character, and known as "Postmaster stamps." These "Postmaster stamps" were issued by various country postmasters by way of experiment. The Providence stamp is the commonest example. 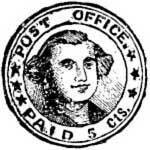 One of the rarest is the 5 c. stamp, with a portrait of Washington, issued by the postmaster of Millbury, in Massachusetts, in 1847. This stamp is said to be worth about £300. There are others reputed to be equally rare. Among the local stamps issued by various unofficial carriers and express agencies, there are many of which very few copies are known, and as they are practically all held by enthusiastic collectors, and never come into the market, there are no data as to their current value. Cape of Good Hope, 1861. Errors of Colour.—In making up the plate of a provisional issue of triangular stamps, pending the arrival of supplies from England, a stereo of the 1d. got inserted by mistake in the 4d. plate, and a 4d. in the 1d. plate. Consequently each sheet of the 1d. contained a 4d. printed in red, the colour of the 1d., instead of blue. And the sheets of the 4d., in like manner, each contained a 1d, which, when the 4d. was printed in its proper colour of blue, was also printed in blue instead of red, the proper colour. These errors are very scarce, especially in an unused condition. The 1d., blue, is the rarer of the two, and is worth about £70 used; it is not known unused. Tuscany, 1860, 3 lire.—In the early days of stamp production high values, such as we are now accustomed to get from most countries, were very rarely issued. 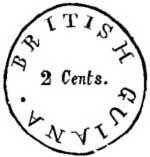 For nearly thirty years Great Britain was content with a shilling stamp as its highest value. In 1860 the Provisional Government of Tuscany issued a stamp of 3 lire, for which there seems to have been very little use. It represented but two shillings and sixpence of English money, but it is nevertheless one of the great rarities to-day, especially in an unused condition. Used copies are worth about £65, and unused about £120. Transvaal, 1878. Error "Transvral. "—This error occurred once in each sheet of eighty of the 1d., red on blue, of the first British Occupation. It was evidently discovered before a second lot was required, as it does not recur in the next printing of 1d., red on orange. It is a very rare stamp. Used it is worth about £50, but unused it is one of the great rarities, and has changed hands at about £150. Ceylon, 1859, 4d. and 8d., imperforate.—Several of the first issues of this colony, designed and engraved by Messrs. Perkins Bacon and Co., and issued in 1857-9, are esteemed as great rarities in an imperforate and unused condition. The 4d., 8d., 9d., 1s., and 2s. are the rarest. The 4d., so long ago as 1894, fetched £130 at auction. These stamps are amongst the few great rarities that may be entitled to rank as works of art, and every year they are more sought after and more difficult to get in fine condition.